Luton Airport is 55 miles away from London and is intended for low-cost flights and charters from Europe. 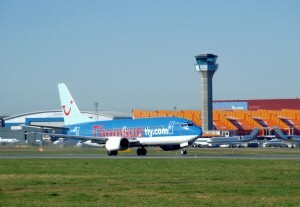 The fourth airport in size and importance in the UK, Luton Airport transports annually more than 8 million passengers. The airport has one terminal, where you will find many facilities that will make your time here go faster. Smoking is not included among these facilities, as it is forbidden in Luton Airport. There are stores with products in the free zone and in the passenger area. Also, in the boarding area you will find a duty free, where you can buy perfumes, confectionery and cosmetics. In the airport, in the free zone near the embarkation gates there are numerous shops, restaurants, cafes and bars where people can get a snack or a delicious hot coffee. Both on arrival and on departure you will find The Change Group Bank branches, ATMs and currency exchange. The Departures Terminal offers passengers an elegant lounge, a room equipped with baby nappy changing tables and other facilities for infants, Internet access Wireless, Boingo, iPass and Skype, post office and an electronic games room. The Arrivals Terminal has the following facilities: travel agency, car rental companies (Avis, Europcar, Hertz, Enterprise Rent a Car), Internet access, Boingo, iPass and Skype and an exchange bureau. Also, the lost luggage office is located on the ground level. There are numerous facilities for the persons with disabilities: special access doors for those in wheelchairs or with dogs, Special Care points in the terminal and also in the parking, office assistance, special phones with screen, Internet access, toilets and priority check-in. There is a frequent special rail service to Gatwick and Stansted Airports and Luton Airport is also served by Thameslink fast racing. From Luton, one can take a private hire (50-60 pounds), a train (about 20 pounds), the EasyBus or the National Express buses to Baker Street, Marble Arch, Victoria Station Earl’s Court or (5-15 pounds). Buses are the most affordable way to go to London. Terravision Company connects Luton Airport and Victoria Station in London. The price is £13 and £16 for the return. The buses leave from outside the arrivals terminal every 30 minutes and the journey takes about 65 minutes. The EasyBus buses connect the airport to Central London and the journey takes approximately 65 minutes. The fares start from £2 and there is the possibility to reserve seats online. Greenline is an express bus that arrives in Central London and the most important stops on the route are: Brent Cross, Finchley Road, Baker Street, Marble Arch and Victoria. From the airport there are 2 trains that arrive quickly in Central London: East Midlands Trains (the journey lasts 21 minutes) and First Capital Connect (the journey lasts 25 minutes). The train travel is between 05.00 – 00.00, at 10 minute intervals. In front of the arrivals terminal there are numerous licensed transfers that will take you to your destination. Be careful as a private hire journey can exceed 100 pounds.